Often in life the easiest things are the best—even when it comes to cooking. If you know how to create a delicious meal with just a few ingredients and a minimum of time, you definitely deserve a round of applause. Whenever I’m in a hurry and want to throw together a quick dinner, there are some recipes I cook over and over again—one of these staples are simple oven-roasted vegetables. Although I could eat roasted vegetables all year round, they are especially welcome in autumn, when the best roasting produce is in season. Even though it becomes an (at least) once-a-week meal, it never gets boring since the vegetables are easily livened up with different seasonings and toppings. And if you choose not to bathe your vegetables in oil, you’ve got a textbook healthy dish that is rich enough to keep you full. Sure, you don’t especially need a recipe here, but there are some tips and tricks you should keep in mind. 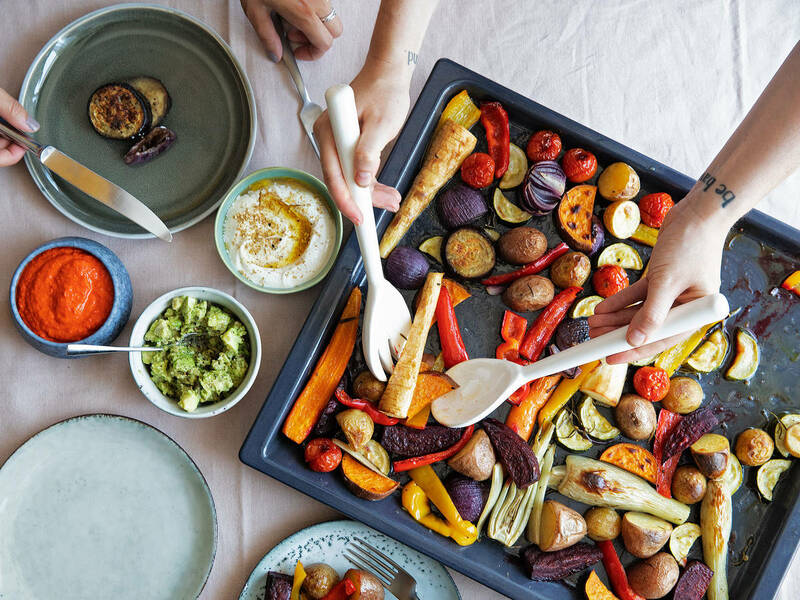 Here’s our guide to perfect oven-roasted vegetables. You can use nearly any kind of vegetables you like—either throw together a colorful mix of veggies or simply one kind of roasted produce. You won’t believe the makeover a little caramelizing in the oven will give to even your least favorite vegetables. For example, I’m usually not a big fan of Brussels sprouts, but roasted and fresh from the oven, I could eat a whole sheet of them. A classic oven-roasted dish would be roasted potatoes, for which you simply need to add some rosemary, salt, pepper, garlic, and high quality olive oil. Depending on the texture you like your potatoes to have, you could either go for more starchier sorts like russet potatoes which will be more al dente, or an all purpose potato like Yukon Gold, that when roasted yields a fluffy interior and crispy skin. I’ve managed to convert some real cauliflower haters with this recipe. The fresh yogurt dip with herbs, almond butter, and lemon is a fresh side to the spicy marinated cauliflower. And if you’ve never had the chance to try roasted radishes, I highly recommend this recipe for roasted radishes with fried camembert. Slice your veggies to the desired size and toss them in oil, either directly on a baking sheet, or in a bowl. Season to your taste, transfer the baking sheet to the oven, and bake at 200°C/390°F. The baking time depends on the kind of vegetable and the size of the slices. Turn the vegetables one or two times to cook evenly and allow them to crisp up on all sides. - Don’t use too much oil! Just take as much oil you need to evenly rub the vegetables—this is easier using your hands instead of a cooking spoon or rubber spatula. The vegetables shouldn’t be swimming in oil. An average amount of 2 tbsp oil per baking sheet should be enough. - A proper baking sheet: A flat baking sheet is the best, as the edges of a deeper one will trap steam and leave you with soft rather than crispy vegetables. Depending on how well-coated your baking sheet is, there is no need to line it with parchment paper or aluminum foil. But in the end it helps you to keep the baking sheet clean. - The right adjustments: For the crispiest roasted vegetables, it’s best to use the air circulation function of your oven, as it circulates hot air through the steam and evenly browns the vegetables. Space is important: Instead of loading a huge portion on the baking sheet, use more sheets or roast the vegetables in portions. Every slice should have contact with the sheet and not be packed in by side by side with other slices. If there’s no space between the vegetables, steam will be trapped and prevent proper roasting action. - How long do roasted vegetables last? Of course it’s best to enjoy roasted vegetables fresh out of the oven, but I can highly recommend making extra and adding the rest to a salad bowl with spelt or rice, making a quick, creamy tahini dressing and taking it to the office for lunch the next day. Roasted vegetables remain fresh in an airtight container for 2 – 3 days in the fridge. You can even puree the vegetables into a soup, stir into some rice or pasta, or use them for a curry. Cooking times will of course depend on the vegetables you use and how thickly you cut the slices. If you decide on using only a single kind of vegetable, you can easily control the cooking time, but what happens when you load a baking sheet with 5 different sorts with 5 different cooking times? Here you’ll have 3 options: Either you add the vegetables one after another to the baking sheet (the one with the longest cooking time comes first), or you could separate the vegetables on other sheets and transfer them to the oven depending on their baking time. Alternatively you could simply cut vegetables with longer cooking times into smaller slices and the other vegetables into thick slices. In this infographic you can see different cooking times to use as a general rule of thumb. Salt and pepper are always a good choice, but let’s get more creative. Choose dried herbs to your taste, or ground spices like paprika powder, curry, cinnamon, nutmeg, and cayenne pepper. Add them along with the oil directly onto the vegetables before baking. Hardier fresh herbs like rosemary and thyme can be added to the oven, but soft herbs like fresh parsley or mint should be added after baking, as the heat will burn them and ruin their flavor. Instead of using the same spice mixture for all vegetables, you could marinate each vegetable differently. For example, add more spices to the pumpkin, and less to bell peppers, and add dried rosemary only to the potatoes. Is olive oil always the best choice? A high quality olive oil is the choice classic for roasted vegetables, but you can experiment with different oils. What’s important that is that it will impart some flavor—for example coconut oil, nutty oils, or avocado oil. You can even add extras to your roasted vegetables. Some of them can be cooked and others should be added afterwards. While baking: Cheeses like mozzarella and feta can be added 10 – 15 min. before the required baking time is over, as they don’t need as long as the vegetables to cook—or better—to melt. Nuts like hazelnuts, walnuts, or pumpkin seeds add texture and added flavor to the dish. Sprinkle them on the baking sheet 5 min. before you remove the vegetables from the oven. After baking: Fresh olives, capers, or pickled jalapenos tend to burn fast and should be added after baking. Roasted vegetables can definitely be a shining centerpiece, and not just a side dish. Serve with a fresh dip and you have an easy weeknight dinner. A honey-mustard dip complements the caramelized flavors of roasted vegetables, while vegetable chips are made to dip in a creamy feta-yogurt dip. Salsa brava is the perfect partner for Spanish oven roasted potatoes, and if you like fish, this trout dip with horseradish will be the right choice for you. Maybe you’re after even bolder sauces like white BBQ-Sauce, a creamy onion dip, or an Argentinian chimichurri? You’ll find more recipes of homemade dips and sauces in this guide. And if you will ever get bored of guacamole, mayonnaise, and hummus, here are some ideas for you to give them a little twist. Of course you can serve roasted vegetables as a classic side dish, for example cevapcici. They also performs well in lukewarm salads. In this fall salad with mustard dressing, roasted pumpkin and roasted chickpeas make a filling main dish. If you’ve ever wondered how to prepare the rather odd-looking romanesco, look no further than your oven. The crunchy bite of the roasted Romanesco and the sweet and sour pomegranate aioli is just delicious. Instead of roasting them on their own, you can fill vegetables with meat, grains, or even more vegetables. You want some ideas? Try this filled paleo zucchini, filled mushrooms with spinach and cheese, a stuffed eggplant with couscous, or a baked sweet potato with fresh vegetables! How do you like your roasted vegetables? Which spices and herbs do you use? Let us know in the comments.